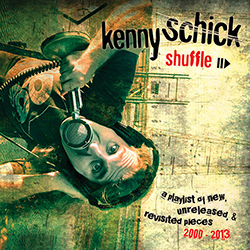 5th solo studio Cd – ‘SHUFFLE’ is Americana with colors of rock, punk and jazz, influences from a multi-genre past. Songs of longing, loss, hope – about love and politics and always thought provoking in his intense and deliberate lyric writing. Schick has a loyal following, and for good reason – his has very entertaining live shows, there is passion, laughter, tears, craftsmanship, and thought provoking lyricism. The shows take listeners on a journey with much interplay between him and the audience. Kenny is a generous performer and uses his quick comedic sense to balance the intensity of the songs, which often explore the darker realms of human experience.